Fourteen years ago, my life was in pieces as I had just received that I had Stage 1 clear cell ovarian cancer. I felt broken. This artwork represents the many faces of women with ovarian cancer. On the right side, her face is beautiful, her lips are full, she has flowing hair; but her eyes are empty as she has not heard the words "you have cancer." The left side represents the survivor that I have become over the years. Just as beautiful, but in a different way just as a broken piece of pottery can be mended and still be beautiful. 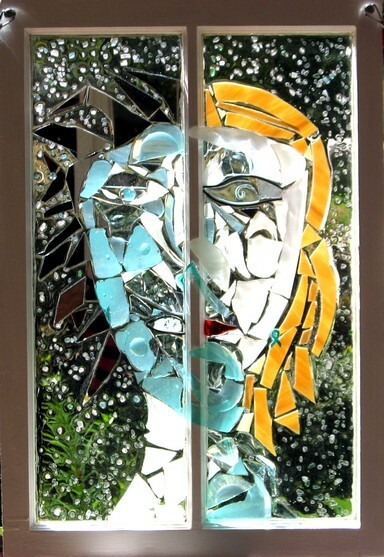 Her "hair" is made of shards of mirrors on this side so that the viewer may "see herself" when she gazes at this mosaic. This mosaic is formed from broken pieces of glass that were once something beautiful ... put back together, they are again beautiful but in a different way. This is my story as told in glass. This is how I picked up the pieces of my life after my diagnosis.